The Furuyama Moromasa Scroll is now available to view online! Regular readers of this blog will have kept up with the story of our beautiful 18th century Japanese scroll. We’re now very pleased to report that you can view the full 44ft long scroll in its entirety on Capital Collections! The scroll dates from the early 1700s and depicts the bustling theatre district of Edo, modern-day Tokyo. The artwork, entitled ‘Theatres of the East’ represents a major discovery in the ‘ukiyo-e’ school of art, and is a detailed illustration of all manner of 18th century Japanese street life. In the Capital Collections exhibition, you can click on each image to zoom in and browse the incredible detail within each section. See if you can spot the bathhouse, the man in his tower keeping a watchful eye out for fires, a puppet theatre, tightrobe walking acrobats, a dog chasing rats away and even a pantomime horse…. Detail showing pantomime horse on stage. Win the chance to see the Moromasa Handscroll! Moromasa Handscroll on Thursday 27th Oct 2016 at 6.30pm in Central Library. This unique painted scroll has undergone 2 years of intensive conservation, funded by the Sumitomo Foundation. Which organisation funded the conservation work on the scroll? E-mail your answer to libraries.specialcollections@edinburgh.gov.uk by 20th October including your library membership card number. You must be a library member and aged 18+ to enter. Only one entry per library card is permitted. The winners will be notified by email by 21st Oct 2016. Last week, we unveiled a rare and beautiful early 18th century Japanese handscroll, which has returned to Edinburgh Central Library after a two year restoration process in the Netherlands. We found the 300-year-old painted scroll, created by Japanese artist Furuyama Moromasa, in our special collections in 2012 – it had lain unnoticed for many years. We worked with National Museums Scotland to secure funding from the Sumitomo Foundation to restore the scroll to its former glory. Restorient Studios, specialist restorers based in Leiden, the Netherlands, did the work. They relined the scroll, consolidated the pigments to reduce the impact of aging, and they provided a custom-made silk casing. Councillor Richard Lewis, Edinburgh’s Culture and Sport Convener, said, “It is fantastic to see this striking painting so beautifully restored, thanks to generous funding from The Sumitomo Foundation. 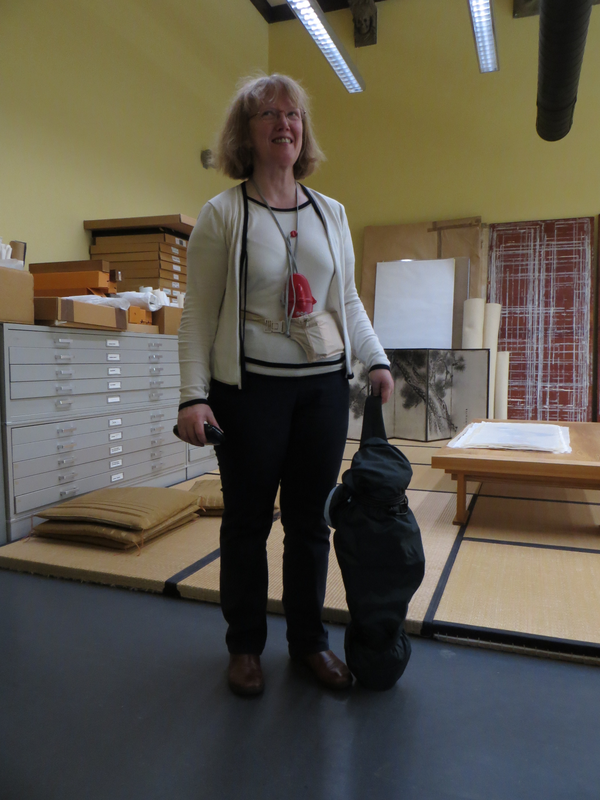 Dr Rosina Buckland, Senior Curator, National Museum of Scotland, said: “Edinburgh Central Library holds a rare and beautiful Japanese painting, created three hundred years ago, presenting the theatre district of historic Tokyo (then known as Edo). The scroll is called ‘Theatres of the East’, and it shows a street scene in the theatre district of Edo, Tokyo. The daughter of Henry Dyer, a Scottish engineer who played a major role in revolutionising the Japanese education system, donated it to the Central Library in 1945. Now that the scroll has been restored, it will go on public display in the National Museum of Scotland’s new East Asia Gallery from 2018. Regular readers will be familiar with the story of our pride and joy – the 13.5 metre handscroll Theatres of the East by eighteenth century Japanese artist Furuyama Moromasa. This unique work of art, featuring street scenes from Edo (Tokyo), had lain in our collections for decades before its international significance came to light. You’ll remember that we took the scroll all the way to the Netherlands for restoring, and we’re happy to report that work on the scroll is progressing really well, and that it has had some very distinguished visitors. Our picture shows Dr Sumitomo and Niiyama-san, Secretary of the Sumitomo Foundation, whose generous support has made the restoration possible. They were accompanied by two eminent scholars in Japanese studies: Prof Matthi Forrer and Daan Kok, curator of Japanese paintings at the world renowned Rijksmuseum Volkenkunde. The conservators use true Japanese techniques and materials. The studio is floored with matting and the tables are traditionally low, so that kneeling is obligatory. 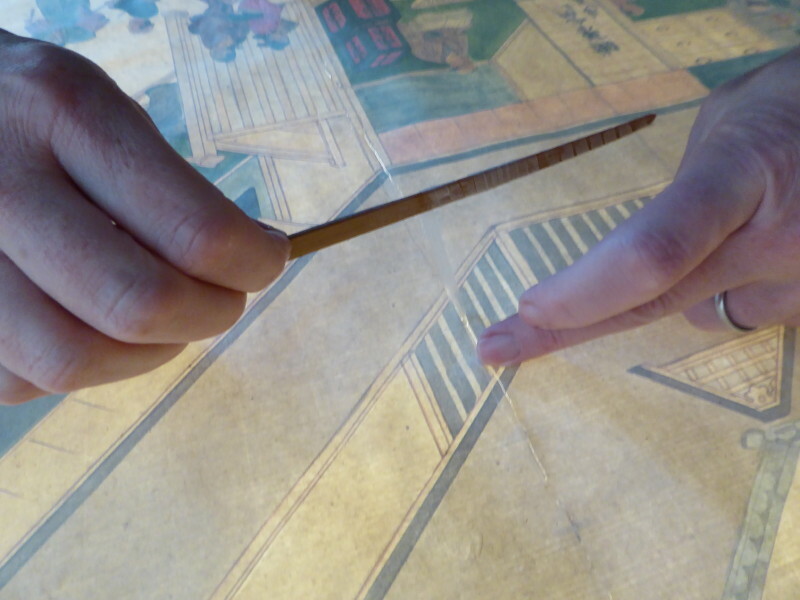 (Visitors not used to kneeling are given a cushion) Here you can see the lining of Japanese mulberry paper (mino-gami) being brushed down with a beautifully soft brush. The next photograph shows how painstaking and delicate the work is treating every crack and crease. It takes a highly skilled conservator with a very steady hand to carry this out, with no room for even the slightest tremor. By next year all ten paintings will be rejoined to form one scroll again. Then it will be returned to Edinburgh and put on public display. If you can’t wait until then to see the scroll take five minutes to watch this short film which gives you an idea of the story behind the scroll as well as the stories within it. The second in our series of short films exploring the Henry Dyer Collection focuses on an extraordinary Japanese artwork from the early eighteenth century. Items from the Henry Dyer Collection is your chance to see some of the most unique items from our collection up close – book now to guarantee yourself a place. And if you can’t make it along you can always view these close-up images of the scroll, or find out more about Henry Dyer and his connection with Edinburgh City Libraries. Edinburgh Libraries and Information Services are excited to announce that the Moromasa Scroll project has completed its first year. 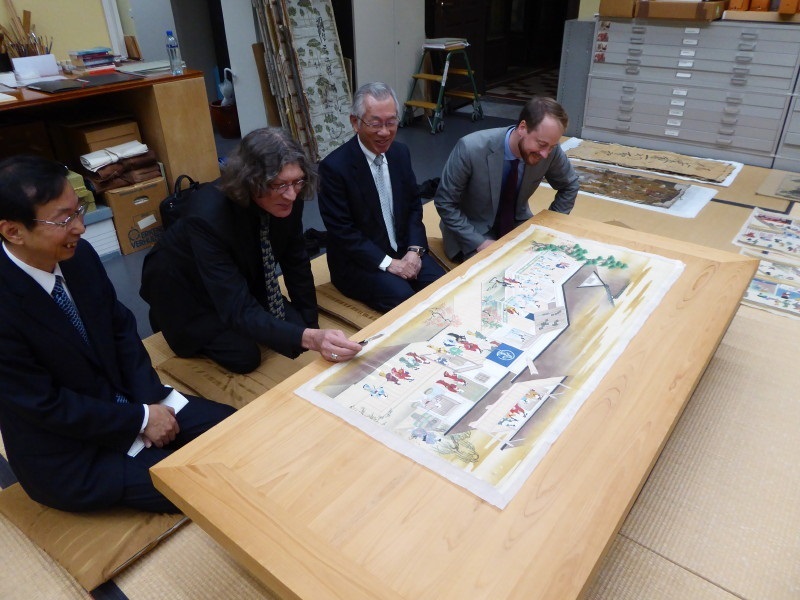 Even more thrilling, the Sumitomo Foundation have generously awarded a further grant for £17,500 to finish the conservation of the Moromasa Scroll. Conservator at work on the Moromasa Scroll in the Leiden studio. The scroll which was brought to light 2 years ago in Edinburgh Central Library has turned out to be a real treasure and an artwork of national importance. As such, securing its future was vitally important. Academics and specialists have supported this work, and have visited the scroll whilst it is away from home in Leiden at the Restorient Studio. One of the visiting academics has gone the extra mile and handmade a traditional roller for the scroll. None were available commercially even in Japan. In return, with its illustration of Kabuki and puppet theatre scenes, the scroll has given researchers information about Japanese theatre they had not previously found elsewhere. And the story is not yet over. The scroll is currently in 10 pieces! No need to worry though, this has been done so it can be rejoined on new lining papers. Its silk cover will be replaced and its silver decoration brought back to life for what should make it a real showstopper. We shall be following progress closely and will keep you updated until the scroll returns safely to Edinburgh Central Library. Many thanks to everyone who is helping to restore the scroll to its original splendour. You can see images of the scroll online at Capital Collections where you can zoom into the incredible detail of life in early 18th century Edo (Tokyo). Last year we brought you exciting news about a rare Japanese eighteenth century handscroll painting which had been discovered in our collections. Really? No pressure then. How will I pack it? What if I lose it? First of all look at the Scroll and check its size. Has to travel as hand luggage. Cannot fold it, cut it down or squash it as per the usual approach to packing. Scratch head – help. With the aid of our in-house expert Janette Gollan, colleagues at museums and an assistant in the Rose Street branch of Tiso’s the Scroll is packed. But only if Pythagoras theory really works will the Scroll slot in diagonally to the luggage space. Just check that with Easyjet as flying to-morrow. No – it is too big. It can only travel in the hold. Crisis. Just pretend you have not ‘phoned and all will be well. Always have a plan B – catch the Eurostar if Scroll grounded. The Scroll left Central Library at 8am on Friday April 25th and got a lift to Edinburgh Airport where it sailed through check-in (no queries) and Border Control. Bit nerve-wracking as the Scroll is fragile 13 metres long and needs lots of TLC, so not really ideal to open at a busy airport security point. The Scroll queued in line and went on board Easyjet to Amsterdam accompanied by its 2 minders. The relief to have it safely on board was immense. Not a nervous flier, but the thought of being turned back at any time was a huge worry. After a smooth flight it landed at Schiphol airport again with the threat of having to be opened, but luckily it sailed through all checks to board the double-decker train. Half-an-hour later it was in the centre of Leiden in time for its appointment with the conservators at the Restorient Studio. The conservators Andrew and Sydney were hugely welcoming and greatly enthusiastic about the Scroll, so it really seems as though it has gone to the right people to treat it. 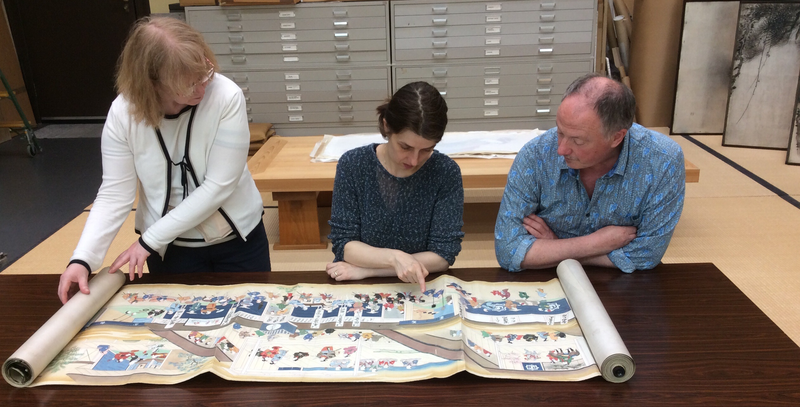 Karen with with Dr Rosina Buckland from National Museums of Scotland, Andrew Thompson of Restorient Studios – and the scroll! They and Dr. Rosina Buckland of the National Museums of Scotland spent the afternoon explaining more about the Scroll and what would happen to it showing some of the processes the Scroll will go through including being beaten hard with a brush. That caused me to raise a concerned eyebrow, but experts know what they are doing. The afternoon in the conservation studio was a real eye-opener as there was some work in progress and some finished work on display. The Studio was extremely professional and impressive. We had to kneel to view the work Japanese style with cushions provided for novices. In just a few hours I learnt an amazing amount and had the chance to view some lovely artefacts. Safely delivering the Scroll felt like a major accomplishment, but it is only the beginning. 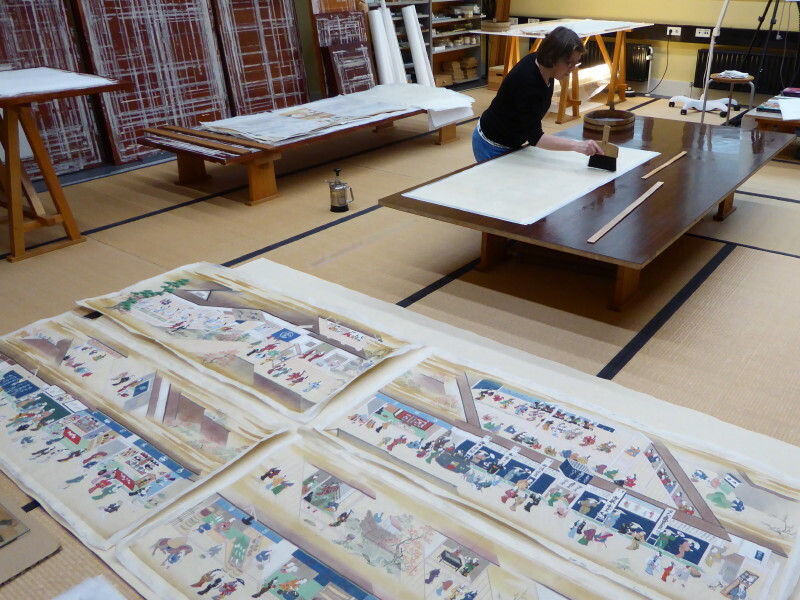 All of the work on the Scroll is being made possible by the huge generosity of the Sumitomo Foundation. Without their funding this unique treasure would not have started its restoration journey. Look out for the next part of the story appearing soon on ‘Tales of One City’….